He has graduated from a local college and has become a United States Citizen. The 2017 conference focused on the issues of U.S. Racism, Militarism and Materialism. how this young Black Poet was inspired by some of the presentations. in the back by police. Such an inspiration my brother is, that despite what life throws at him he handles biz. And he handles it gracefully. How far will the protest go? Feels like I'm a protest Pro! Still here, but he's got to go. Only weeks since he got the position. And met some amazing human beings- our next-door neighbors. They took our resources and left us with nothing. Now my brothers and sisters gotta learn how to be resourceful and even in their stealing they were not remorseful. Then the proper tools must be collected. 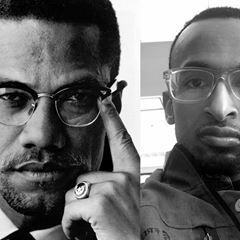 People accuse my brother Malcolm of spewing hate. But what about the hate coming from the one who claims he'll make America great. At least with Malcolm it made some sense. You'd think the governor could take a hint. He said we don't have " a little bit"
What happened to the sunshine? People dying but what for?